This week's Zen Dog Spotlight features the energetic, loving and did we mention incredibly handsome Chinook, Tahoe! Our team members absolutely adore taking Tahoe on his daily walks, and he always greets us with the best kisses and a huge hug. Tahoe's gorgeous mug has been featured on our Instagram, @dogzenergy multiple times, he really is a pro at posing for the camera. Take it away Tahoe! "Hi! My name is Tahoe. I am a Chinook. I am bread for sledding. I was born inNew Hampshire where the Chinook is the state dog. I moved to San Diego with my pet parents 3 years ago." "I like to tear my toys to pieces so my favorite toy is always changing. Right nowI am loving my 3 squeaky bears from Costco." "On typical days, I get morning and evening walks with my pet parents and spend the rest of the day inside with my cat brother, Sanchito. My favorite part of the day is my long afternoon walk with Tristan from DogZenergy"
"My ideal day would be spent outside playing in the snow followed by a long evening nap on the couch next to my pet parents." "My best friend is Reggie, the big brown lab who lives across the driveway. I just love him so much, I would run across the street in front of cars to say hello if I was not on my leash." "Please stop asking me to sit and stay. Never stop asking if I want to go for a walk or have a cookie." If you were going to win an award at the "Oscar Pet Awards" would you want to win it for 1.) Cuteness 2.) Heroism/Courage 3.) Sassiness 4) Loyalty 5) Fashionista. Give us a quickexample/story of why we should pick you! "I think I would have a good shot at the Cuteness Award. Although I am 6 years old, Istill think I am a puppy. I like to be held like a baby and sometimes I try to climb up on my pet parents' laps while they are eating dinner." "My special talent is skijoring: I pull my pet dad through the snow while he is on cross­country skis." 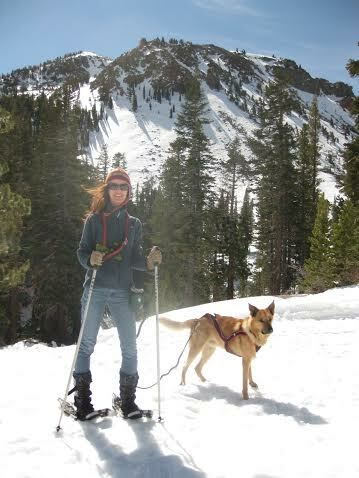 A big thank you to Tahoe and his mama Liz for participating in this week's Zen Dog Spotlight!